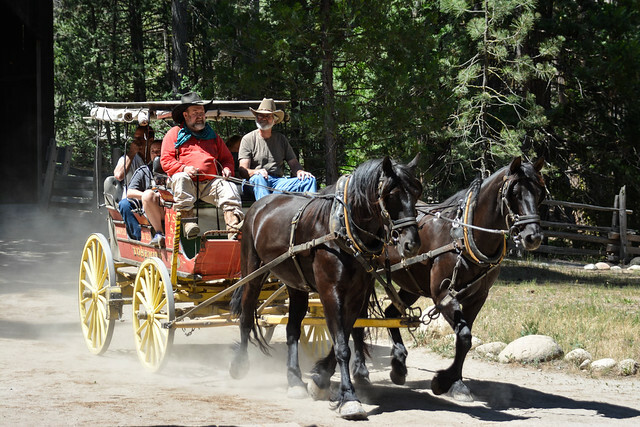 Did you know that you can actually take a ride on a horse-drawn stage coach? You can! Just go up to the Settlers Village in Wawona and head over by the stables next to the covered bridge. A ranger will be there to give you the details. I’m sure you’ve got your Memorial Day trip to Yosemite all planned out by now, right? Right? Wait, no? Well here’s some fun and exciting activities for everyone in the family to make this Memorial Day trip to Yosemite “THE BEST EVER” (as my daughter says). Take a hike to the top of Vernal and Nevada Falls. Tickets are available at any tour desk. Provided by DNC. Everyone likes to start their morning with a nice, warm cup of coffee. Especially in the mountains. Bring a mug to the Wawona Campground Amphitheater and have coffee, tea, and hot cocoa with a ranger (I happen to know they like coffee, too). Use this time to plan your day, have questions answered, or just hang out and enjoy the morning air and a cup of joe. Yosemite is arguably THE home of big wall climbing. Climbers journey here from all over the globe to try to conquer some of the worlds most challenging climbs. But big wall climbing isn’t for everyone. If you’ve ever wondered about what it’s like to be a climber in Yosemite then this is for you. Watch climbers on El Capitan through a telescope while a ranger answers your questions about climbing in Yosemite. This program is FREE and open to anyone. The walk starts at 11AM and lasts for 4 hours. Bring the kids. Telescopes are a great way to get them close to the action without ever leaving the ground. Come join photographers from the Ansel Adams Gallery for a walk around Yosemite Valley. This walk is presented by The Ansel Adams Gallery and starts at the Ahwahnee Hotel. Pre-registration is required. Ticket information and pricing is available at The Ansel Adams Gallery. For more information call (209) 372-4413. Photo by me! You can check out, or even submit, more photos in our Yosemite Blog Group Pool on Flickr. All skill levels are welcome. It’s not a place to be judged, just share. Who knows, I might even share your photo on the blog.